Discussion in 'K-POP' started by haylucky, Apr 29, 2017. A fan was talking to Wonho’s mother at MoMo Coffee, and when the fan asked about his name ‘Shin’ on the internet, she explained that his name is actually Lee Hoseok. 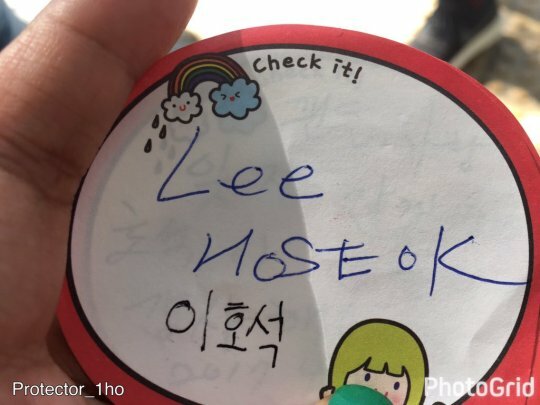 Below, in blue handwriting is Wonho’s mother writing his real name, Lee Hoseok! P/N: I do understand that this is not an official announcement by Starship, however I do know the fan who met Wonho’s mother personally, so I can confirm that this is indeed what Wonho’s mother said and wrote! SAJsn, Viv_Iann17 and xoxoshawol like this. ArieIIe, XV_Dream, Viv_Iann17 and 3 others like this. Ryugagotoku, ArieIIe, RavenHikari and 5 others like this. Ryugagotoku, RavenHikari, Viv_Iann17 and 4 others like this. Ryugagotoku, KristinaPutri, RicoVNlt3K_POP and 8 others like this. Ryugagotoku, haylucky and MonbebeX like this. Ryugagotoku, Viv_Iann17, haylucky and 1 other person like this. Ryugagotoku, RavenHikari, xoxoshawol and 1 other person like this. RavenHikari, xoxoshawol and Viv_Iann17 like this. Ryugagotoku and haylucky like this. + the man knows it. xoxoshawol and haylucky like this. Can you please tell me what this show is?